Manhattan Borough President Scott M. Stringer (aka "the Shlub") was scheduled to present the STONEWALL Rebellion Veterans' Association ("S.V.A.") with a Proclamation from the Borough of Manhattan. It was especially relevant since the Stonewall Rebellion happened in the borough of... Manhattan! The occasion was the "38th Anniversary of the Stonewall Rebellion" sponsored by the S.V.A. at The Stonewall Inn on June 27th, 2007. Original Stonewall Club veteran and SVA's director Williamson Henderson hosted the exciting event. Besides actual Stonewall veterans and public officials, the ultimate special Stonewall guest was (drumroll)... Mary Weiss, the lead singer of the legendary girl group The Shangri-Las. Stonewall veterans -- anxious to meet and greet "The Leader Of The Pack"'s voice Miss Weiss -- also included Jeremiah Newton, Storme DeLarverie, Emile Griffith, Rusty Rose, Leigh Peter McManus, Brooke Lynn, Ramon Bellido, J.C. 'Joni' Sobel, Bert Coffman and Ruthybird! Everyone was greeted at the front door -- not by Blond Frankie of 1969 -- by SVA's office handsome and hot mocha manager AnDre Christie. For entertainment, original "Songs Of The Stonewall Jukebox" were appropriately played throughout the entire event. Miss Weiss got a kick out of hearing some of her Shangri-Las' songs from the old Stonewall Club jukebox playing at the new Stonewall Inn! The fun-filled event was also a fund-raiser for the non-profit S.V.A. Unfortunately, at the last minute, The Shlub did not show. Instead he sent someone even more boring in his place who gave a dubious excuse as to why The Shlub chickened out. The gay guy read the proclamation with about as much feeling as a shlub! 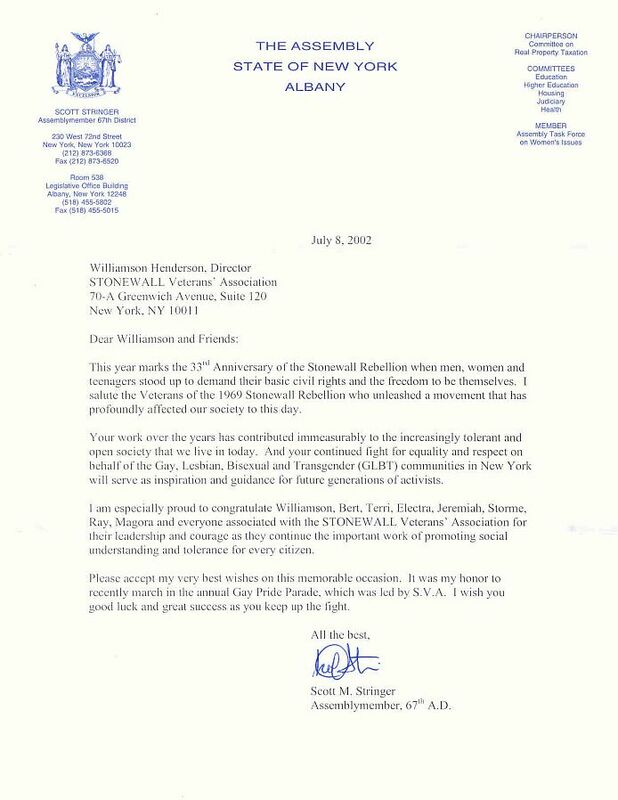 To fit the Stonewall occasion and the no-show, Williamson, the SVA's "Leader Of The Pack", 'donated' the Shlub's Borough of Manhattan proclamation to hang eternally on a dingy wall of the little cubicle office upstairs at the back of The Stonewall Inn in Manhattan. Read: S.V.A. did not want it!